Anterior compartment syndrome, also known as anterior shin splints arises when the big muscle on the outside front of the lower leg becomes too big for the sheath that surrounds it causing pain. 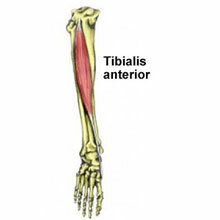 A tibial stress fracture is a hairline fracture of the tibia bone in the lower leg, caused by overuse or repetitive stress. Symptoms are very similar to ‘shin splints’ with gradual onset pain on the inside of the shin.